Simply state “Pyramide” to any French person who has a fine appreciation of food then sit back and listen. One and all will tell you without hesitation that it is the greatest restaurant in France. It is seldom that the French agree on anything in an almost unanimous fashion, but for some reason they do agree about the Restaurant de la Pyramide. What’s more amazing than the universal agreement of the restaurant s merits is the enchantment people have in recounting their dining experiences there; it’s almost like they are fondly telling the tales of an old love affair. As you listen to the stories your mouth begins to water and your stomach starts letting you know that you’re hungry. Suddenly, you find yourself with an urge to have dinner at the Pyramide and nothing else will do. 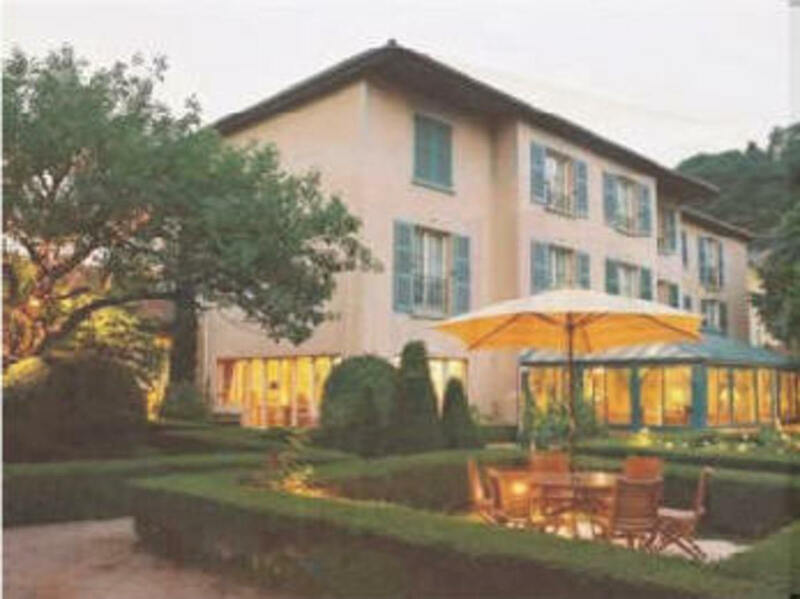 This temple of gastronomy is located in a rather drab little town called Vienne, halfway between Paris and the Riviera. There isn’t much reason to visit Vienne or even stop over – except to enjoy the meal of a lifetime. The town itself has been plodding along since the first century B.C. and was once one of Julius Caesar’s Roman colonies. On your way to the restaurant you will pass a tall pyramid standing on a base with four arches, right in the middle of the street. It once marked the center of a Roman circus where chariots raced. These days traffic slows here as much of it heads toward the restaurant, which took its name from this old Roman landmark. The Pyramide is a small, neat country house set in a quiet garden behind a high wall, much as it has been for over a hundred years. There was once a sign on the gate that simply said “Fernand Point, Restaurateur,” although these days the sign just says the restaurant name. Most of the people in restaurant circles and food aficionados are well aware that Fernand Point was one of the 20th century’s greatest restaurateurs. His ideas greatly influenced what is considered fine cooking today. It was Point who first insisted that great food must be pleasing to all senses; taste, smell, sight, and even touch and sound. His china and glassware were chosen to please the eye, but he also paid attention to the clinking sounds made his plates and goblets. In some restaurant the crockery clatters; in the Pyramide, it has almost a musical tinkle. The table linens are spotless white and their freshly laundered fragrance adds to the dining experience. In the spring and summer, tables are set out on the terrace under the trees where you can dine in the cool shade. The setting has been carefully designed to complement the pleasures of dining. There is a sweep of neat lawn surrounded by flower beds and gravel walkways presenting a garden that is simply elegant. These attributes are the secret behind the acclaimed dining experiences of many and for which the Pyramide is famed. The food is not fancied up unnecessarily though the original flavors of each dish are artfully enhanced. There is a great deal of thought behind the presentation though the food itself is never disguised to be something it’s not. The elegance of the Pyramide comes from its simple traditions. It has been said that this kind of cooking can only b done by a master chef, an artist, a Rembrandt among cooks. Madame Point kept her husband’s recipes under lock and key never allowing them to be fully published. She did, however, release three recipes to a family friend; one of which will be shared here. The Marjolaine Cake was one of Fernand Point’s masterpieces of pastry. Marjolaine means sweet marjoram though neither the flower nor the herb has anything to do with this cake. When Point made this cake for his restaurant he stenciled the famous pyramid from the square onto the sugared top of the cake. These days the cake is decorated a little more elaborately, unless, of course, you are less than a wiz at cake decoration. Please, enjoy this delightful cake. 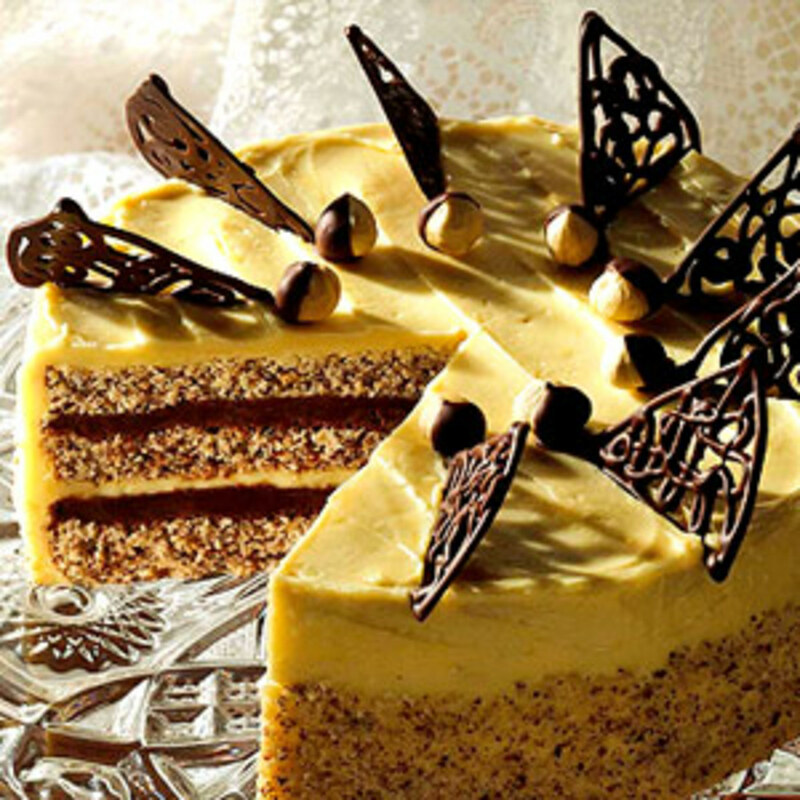 This cake has three parts; the meringue-Nut Cake, the Chocolate Wafers, and the Butter Cream. Each part has it's own prep time. The cake part is the only part that requires baking. The other two parts require some chilling time. 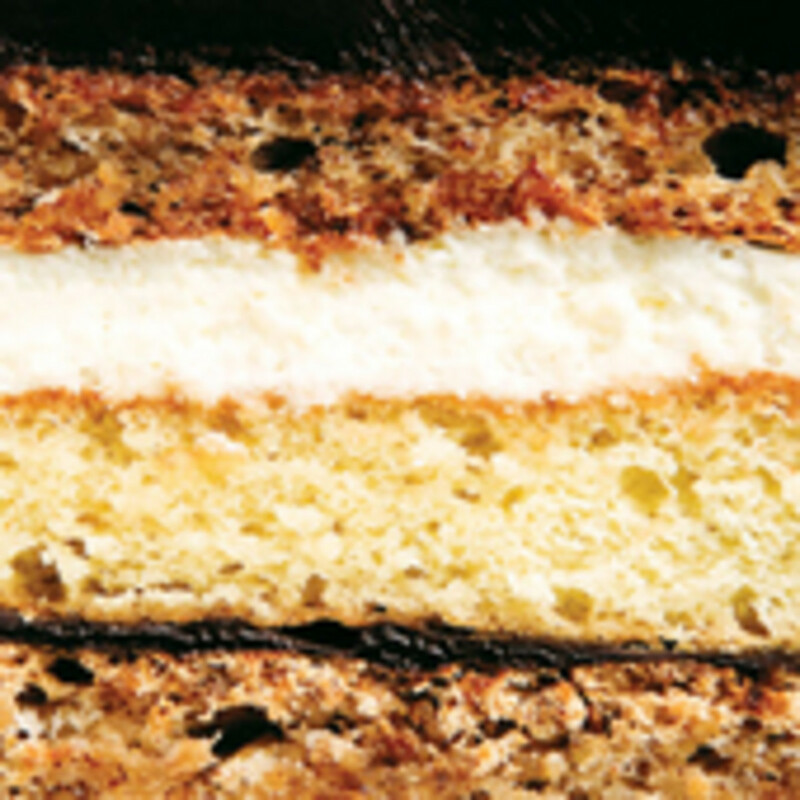 Cross Section of Marjolaine Cake layers. 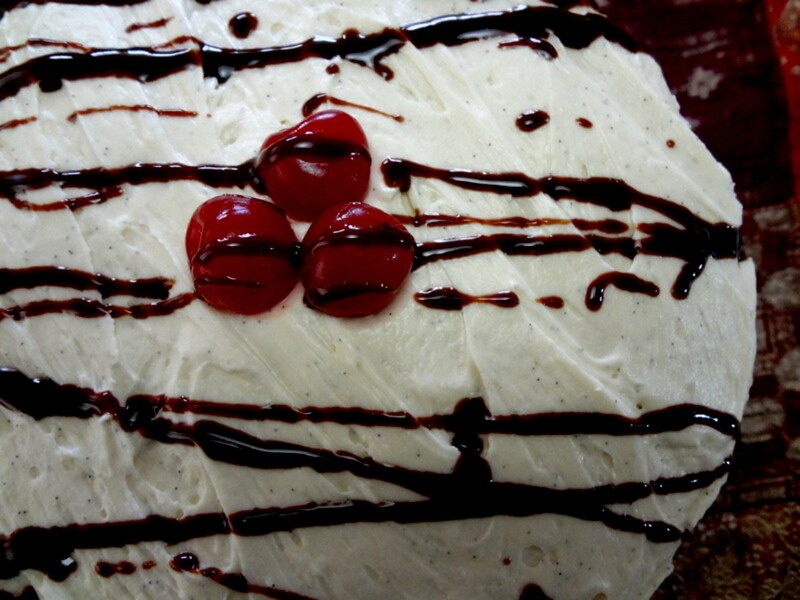 Amateur Marjolaine Cake without Chocolate Cream Frosting. In separate baking pans or pie plates put the almonds and hazelnuts. Bake in the hot oven for 20 minutes or until browned, shaking the pans occasionally. Remove from oven and cool. DO NOT turn off oven, reduce the heat to 250 degrees. Once the nuts are cool grind 1 cup at a time in a blender on high speed for about 5 seconds then empty into a medium bowl. Mix ground nuts with sugar, set aside. Add salt and cream of tartar to egg whites. Gradually fold in the nut mixture. Line baking sheets with wax paper and butter lightly. Mark the wax paper to note 4 bands about 12 inches long and 4 inches wide. Spread the meringue-nut mixture on these bands thickly. Bake about 30 minutes or until crusty on top but still pliable. Remove from oven and carefully invert onto another sheet of wax paper. 1. 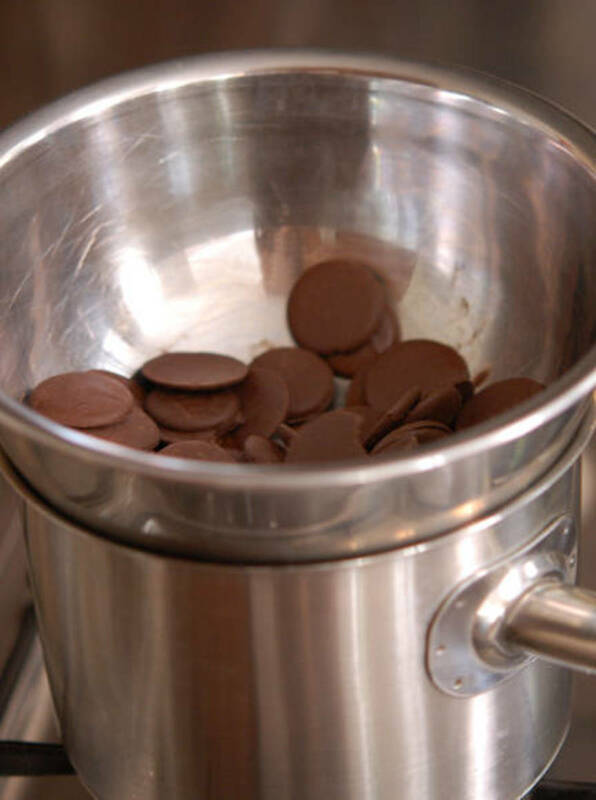 Place chocolate chips in a glass or stainless steel (best) bowl. 2. Choose a saucepan that will allow the rim of the bowl to rest on the rim of the saucepan. 3. Fill the saucepan with water and bring to a boil. 4. Remove water from the heat. 5. Place bowl with chocolate chips in the saucepan over the water. 6. Allow the chips to melt stirring occasionally to make sure all of the chips have melted. 7. Cut 2 1/2 inch circles from wax paper. 8. Spread circles with a thin coating of melted chocolate. 9. Place rounds on a cookie sheet and chill until firm. 1. In a medium saucepan combine sugar, water, and cream of tartar. 2. 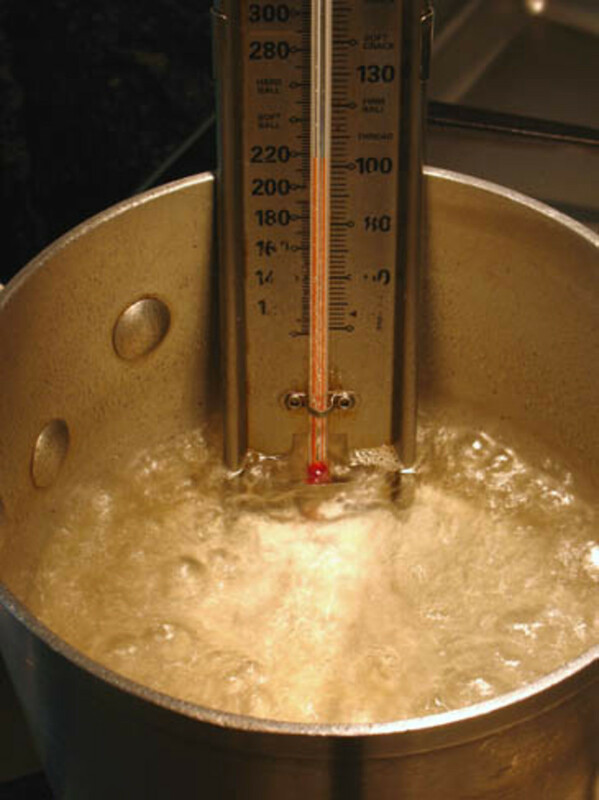 Bring to a boil; rapidly boil to 240 degrees on a candy thermometer or until syrup spins a long thread. 3. Place egg yolks in a medium bowl. 4. Gradually add hot syrup to egg yolks while beating. 5. Beat syrup and egg yolks until cool and thick. 6. Cut butter into pieces. 7. Bit by bit, beat butter into egg mixture. This produce 1 quart of butter cream. 8. 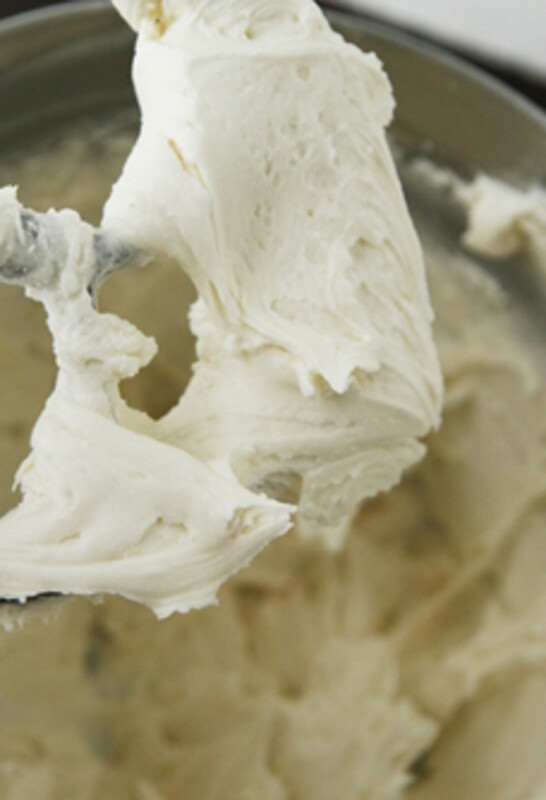 Measure out 1 cup of butter cream and add vanilla, mix lightly. 9. 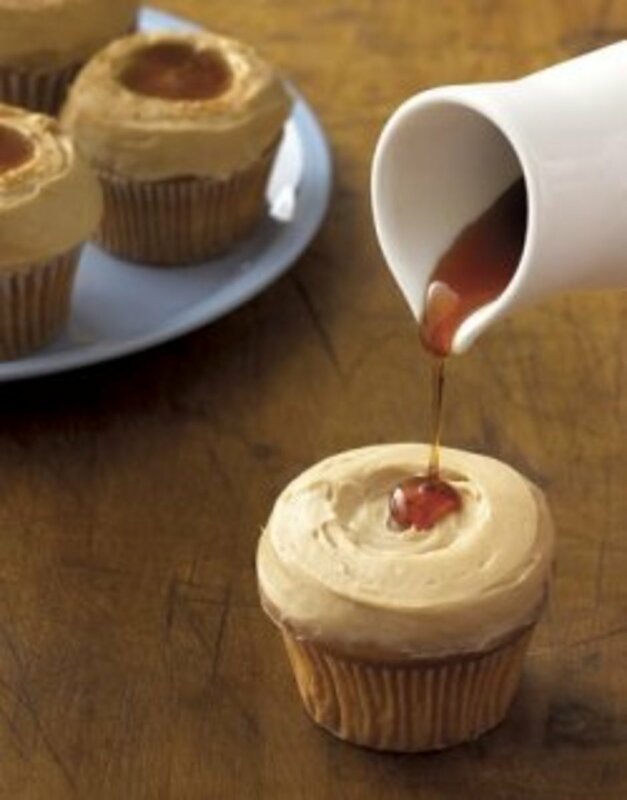 Measure out a second cup of butter cream and add praline powder, mix lightly. 10. Melt chocolate chips with water. 11. Stir melted chocolate into the remaining butter cream. 12. Chill the creams until ready to spread. Amateur Marjolaine Cake with Chocolate Cream Frosting. 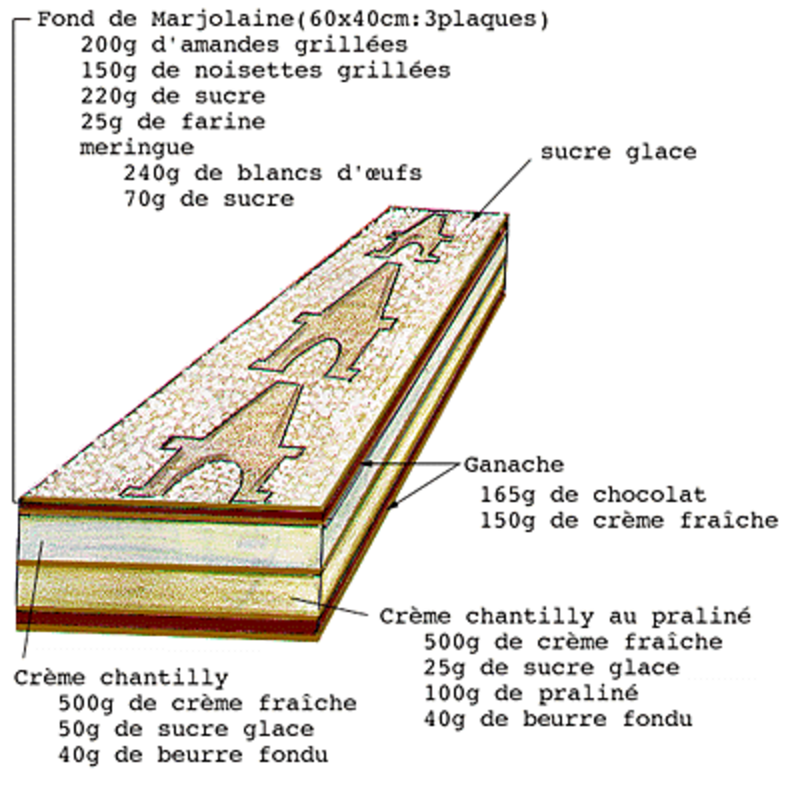 Template in French of how the Gâteau Marjolaine was decorated for the Restaurant de la Pyramide. 1. Place a meringue-nut band on a serving plate. 2. Spread with vanilla cream. 3. Top with a second meringue-nut band. 4. 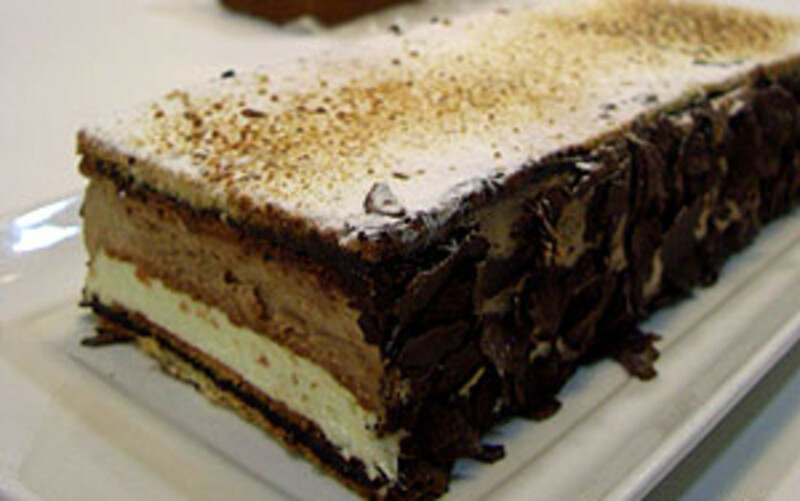 Spread with chocolate cream. 5. Top with a third meringue-nut band. 6. Spread with praline cream. 7. Top with the fourth meringue-nut band. 8. Frost top and side with remaining chocolate cream. 9. Dust the top of the cake heavily with confectioner's sugar. 10. Carefully peel the wax paper away from the chocolate wafers and decorate the sides of the cake with them, overlapping the wafers all the way around. 11. Serve on a plate drizzled with chocolate syrup if desired. 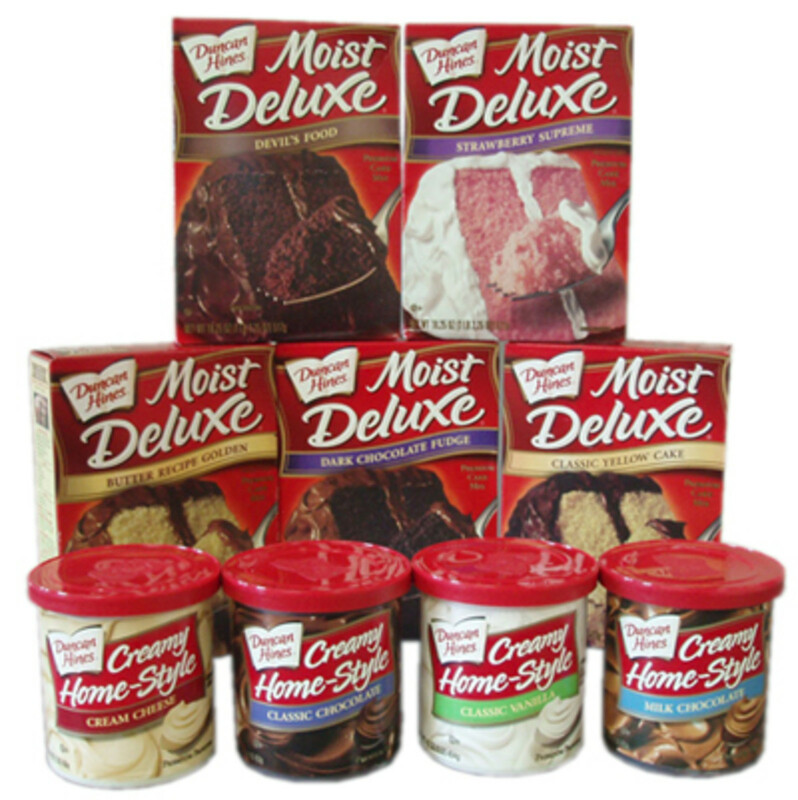 Store uneaten cake in the refrigerator lightly covered. Discard unused portions after 5 days. Sorbet Au Porto is also known as Port Wine Sherbet. 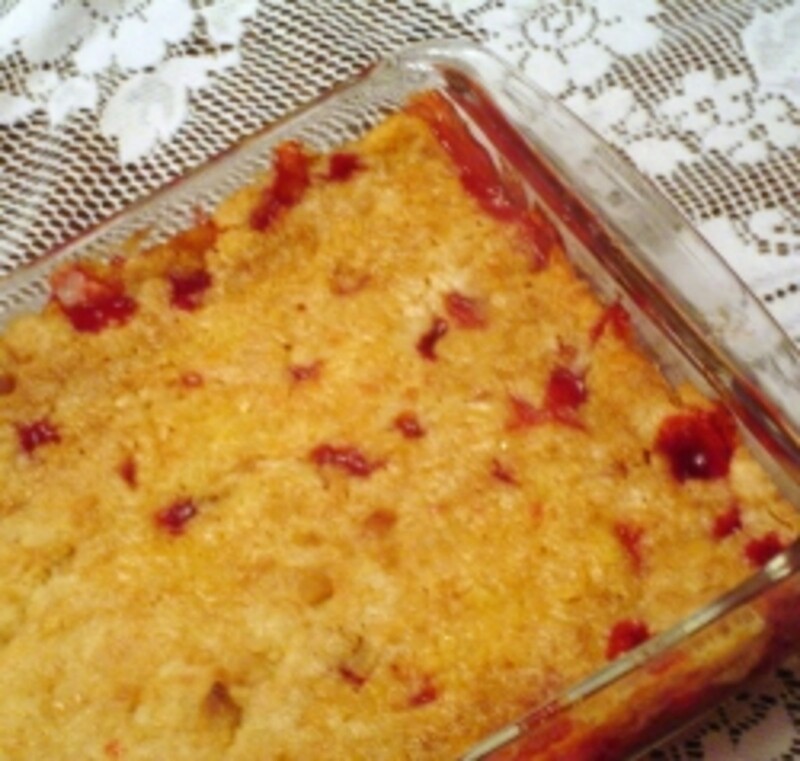 This distinctive sherbet can be served either as a dessert or as a refreshing intermezzo between the appetizer and the main course.This wonderful recipe is prepared without an ice cream maker. What a rich and elegant dessert - I'm in awe of chefs who can invent intricate recipes like this - they're delicious, unique, and expertly crafted. Thanks for sharing this - I've never heard of it, so I feel I've had an International experience here!